seniors Meg Adams, Brendan Casey, Bridget Dalton, Emma Duryea, Chloe Kekedjian, Maria Minuesa, Alexandra Schwartz, Isabelle Stone and Leo Van Munching are all featured in the Katonah Museum of Art’s Young Artists 2018 Exhibition. Now in its 35th year, this art show features pieces by senior art students from surrounding area high schools. The Young Artists 2018 Exhibition will be on display through Feb. 11 at the Katonah Museum of Art, 134 Jay St., Katonah, N.Y.
Stewart’s Market and Planet New Canaan have teamed up to promote the use of reusable bags and support The New Canaan All Sports Booster Club. 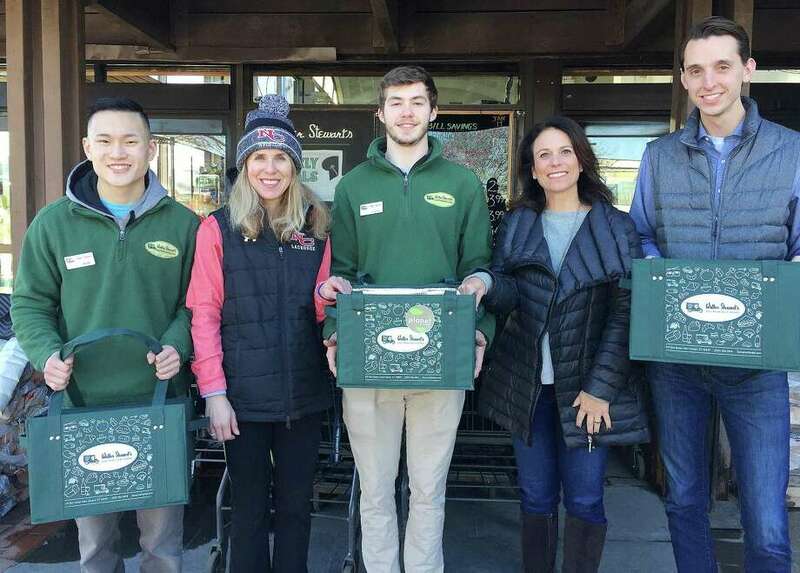 From now until mid-March, for every reusable bag used, 5 cents will go to New Canaan All Sports Booster Club. This donation is in addition to the Stewart’s Market policy of a 5-cent discount for each reusable bag used by customers. Any reusable bag may be used for the donation and discount. Stewart’s Market does sell a variety of their own bags, including an insulated bag, and customers can use their T-Bill points toward the purchase of bags. Planet New Canaan is a non-partisan group, founded by local members of the community, committed to bringing awareness about the environmental issues that face New Canaan and the world, both today and in the future, through film screenings, presentations and community outreach. Four New Canaan students at Fairfield University received undergraduate dean’s list honors for the fall semester: Gabriella Borea, Michael Alexander Donofrio, Erika Leigh Jensen and Kaitlyn E. Sandvik. In order to be placed on the dean’s list, students must have completed a minimum of 12 credit hours in a semester, have no outstanding or incomplete grades for that semester, and have attained a semester grade-point average of 3.50 or better. Sarah Hardy, from New Canaan, was recently named to the dean’s list at the College of William & Mary in Williamsburg, Va. for the fall semester. In order to achieve dean’s list status, a full-time degree seeking undergraduate student must take at least 12 credit hours and earn a 3.6 quality-point average during the semester. Three New Canaan natives have been named to the dean’s list at the University of New Hampshire in Durham for the fall semester. Highest honors are awarded to students who earn a semester GPA of 3.85 or better out of a possible 4.0. Students with a 3.65 to 3.84 average are awarded high honors and students whose GPA is 3.5 through 3.64 are awarded honors. Margaret Tensen made the list with honors, while Francesca Anselmo and Tess MacKenzie made the dean’s list with highest honors. New Canaan native John Fiorito, who is majoring in finance, was placed on the dean’s list at The College of New Jersey for the fall semester. To achieve this honor, a student must carry 12 or more credits that semester and earn a 3.5 (or above) GPA. Lauren M. Catalano has been named to the President’s List for the fall semester at Elon University. The President’s List is composed of students with no grade below an A-minus in a minimum of 12 semester hours. Catalano is the daughter of Peter Catalano and Carol A. Catalano, of New Canaan. Molly K. McQuilkin, of New Canaan, earned placement on the Gonzaga University dean’s list for fall semester. Students must earn a 3.5 to 3.84 GPA to be listed. Worcester Polytechnic Institute (WPI) named two New Canaan natives to the university’s dean’s list for academic excellence for the fall semester. Colette Pellegrini de Paur is a member of the class of 2018 majoring in management engineering and Charles Steele is a member of the class of 2019 majoring in mechanical engineering. The criteria for the WPI dean’s list differs from most other universities as WPI does not compute a GPA. Instead, WPI defines the dean’s list by the amount of work completed at the A level in courses and projects. New Canaan’s Katrina Saitta and Courtney Coutts have been named to the University of Delaware dean’s list for the fall semester. To meet eligibility requirements for the dean’s list, a student must be enrolled full-time and earn a GPA of 3.33 or above for the semester. Four New Canaan natives — Brian Devito, Noah Hedley, Darrell Valenti and Jaime Warlich — have been named to the dean’s list at Roger Williams University in Bristol, R.I. Full-time students who complete 12 or more credits per semester and earn a GPA of 3.4 or higher are placed on the dean’s list that semester. Christina McLaughlin and Kane Curtin, of New Canaan, have been named to the University of Vermont dean’s list. To be named to the dean’s list, students must have a GPA of 3.0 or better and rank in the top 20 percent of their class in their respective college or school. Danielle Meyers, of New Canaan, was named to the dean’s list at The University of Rhode Island in Kingston. To be included on the dean’s list, students must have completed 12 or more credits during a semester for letter grades with at least a 3.30 quality-point average.